Graham was born in Coventry in 1944 in the heart of the motor industry and grew up with a passionate interest in the motor car and motor sport. He clearly remembers the sight and sound of “C” and “D” Type Jaguars being road-tested past his childhood home and has vivid memories of first visits to Silverstone in the mid fifties. After leaving school Graham trained as a Technical Illustrator at the Coventry College of Art then joined one of the city’s leading illustration and design studios. He was engaged in all forms of line and airbrush exploded and cutaway drawings and worked on a varied number of contracts including motor cars and commercial vehicles, aircraft and machine tools. After nine years, he went into partnership and formed Baron-Bosworth Publications, an art and design studio. The studio secured contracts from all areas of industry including power generation, motor vehicles, machine tools, hydraulic equipment through to furniture, industrial compressors and boat building. Graham then worked as a freelance artist, illustrator and graphic designer and in recent years has concentrated on painting. He likes to work in both oils and water colour/gouache and pays much attention to technical detail in his paintings. 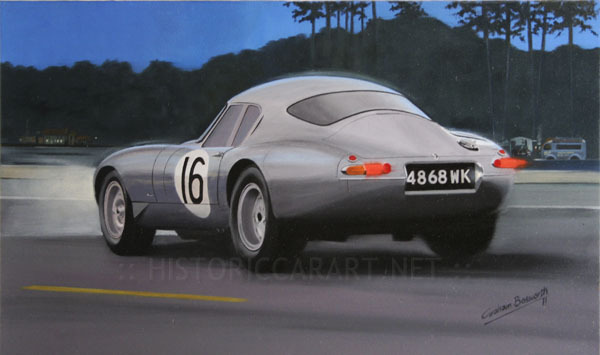 His work has been exhibited at the Gibson Moore Gallery, Silverstone Classic, Goodwood Festival of Speed, the International Historic Motorsport Show at Stoneleigh, the Historic Car Art Gallery, the Coventry Transport Museum, the British Motor Industry Heritage Centre, Gaydon as well as many Guild of Motoring Artists exhibitions. One of the highlights of Graham’s career was a commission for Jaguar Cars of the Queen Mother’s Mk 7 Jaguar. This was presented to her on her 100th birthday. Several paintings are on permanent display in The Jaguar/Daimler Heritage Museum. Graham is the official artist commissioned to paint the winning car in the Autoglym National Concours competition. Graham has undertaken commissions and sold paintings from as far a field as Saudi Arabia to Holland, Germany and the USA and prints of his Formula One paintings, Le Mans montages and Historic motor sport scenes are sold worldwide.